Who We Are — Bay View Printing Co.
Ashley: Designer, Printer & Boss Lady. She’s also the heart of this operation, pumping blood into the veins of the business. She’s an eternal go-getter, with a knack for accepting challenges with ease. Can you acquire a 100 year old printing shop and all of its contents? Sure! 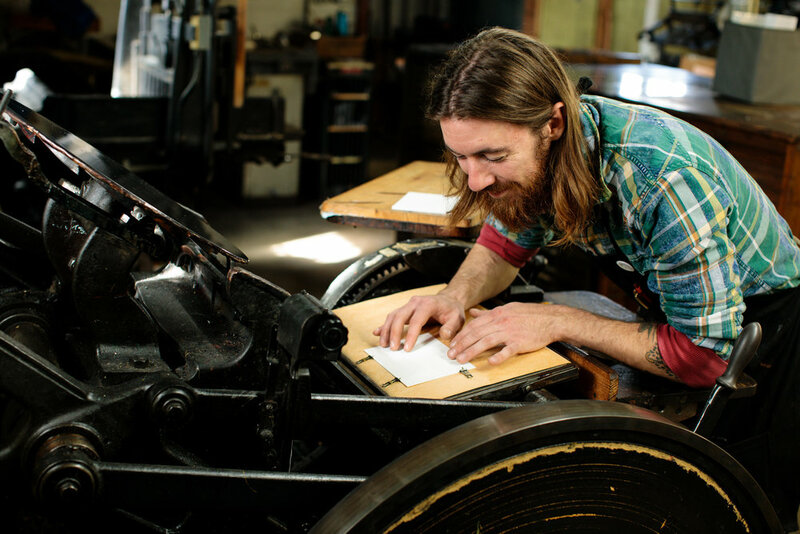 Can you transform that shop into a place where people come together as a community over the beauty and art of letterpress printing? SURE! From the beginning, Ashley’s goal was to take this treasure chest of a business and share it with anyone interested in design and letterpress. After years of designing and teaching, she became the third owner of Bay View Printing Company and created a space where people can come to learn, explore, share and make. Ashley has both the ability to create a gorgeous and one-of-a-kind design, and to also let her clients/customers/members realize their own vision. Lucas: Printer, Typesetter& Poster Boy. He’s also a type-organizer extraordinaire. His fascination for typography and old machinery led him to BVPCo after graduating with a BFA from Milwaukee Institute of Art and Design. He now helps with most of the printing, and hosts Drink & Ink (where he met his lovely girlfriend). Lucas also assists members at open studio, and has a killer musical playlist and repertoire. He’s into cooking, baking, skateboarding, bicycling and basically any other outdoor activity, playing drums in the world’s best rock n roll band Scarecrow Dave, and road tripping across the country to other letterpress shops. He’s not into religion, politics and McDonald’s, so don’t try and hash out any problems over a Big Mac and Coke with Lucas. He’s more of a local beer kind of guy, anyway. She can really get into Moscow Mules and Pokemon cards, but never at the same time. Danielle ecstatically joined BVPCo in 2017 where she gets to ink up alongside a couple of her favorite humans and pour her heart into making clients design dreams come true. BVPCo allows Danielle to be a thinker & maker, community supporter, lifelong learner, and teacher. Favorite part of her day is oooohhhhing & aaaahhhhhing over the first impression hot off the press - witnessing the magic that happens when a flat design gets some letterpress love. Always a designer and teacher, she previously spent many passionate years in the classroom working with exceptionally talented students and coworkers… which is where she met Ashley and Lucas to begin with! Fun Fact: Lucas was once her student, and now she's his print apprentice!